Fear comes with many faces. Each with the power to block your knowing. The source of fear is typically imagined, yet very familiar. Right action is the solution. Quiet your mind to transcend fear, think about what’s worked in the past. Act accordingly. 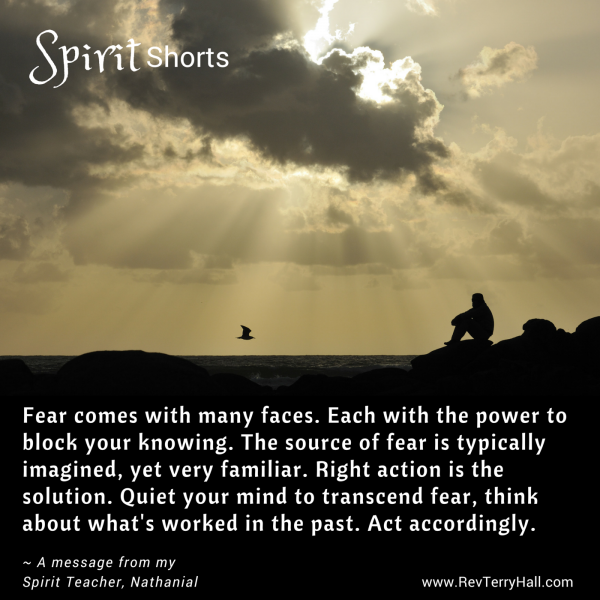 Message from my Spirit Teacher, Nathanial. OpEd: What makes you afraid? For some it’s things. For others it’s people. And still others it’s their own power. Which ever face your fear takes on, transcending it with Right Meditation allows you to find the right solution that inspires right action. But what if you haven’t mastered meditation to the point of transcending fear? This is where your journal comes into play. During your lifetime, you’ve had times where you’ve taken actions that got you desired results in the face of your fear. Being able to refer back to past successes allows you to have a plan of action for the current situation. Even if the past situation didn’t turn out perfectly, you can adjust the plan and proceed. For indeed, action has it’s own rewards the biggest being that when you’re in action and moving you can make adjustments. Where as if your not in action, there is nothing to adjust.